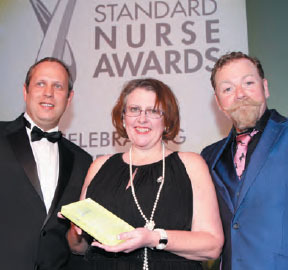 Career advancement was not Amanda Burston’s aim when she entered the 2015 nurse awards run by RCNi, but winning has certainly raised the profile of her work. ‘Since the award, the attention our group has received has been national. We have had many enquiries about how to replicate the programme and the initiatives we have developed,’ says Ms Burston, who was recognised for setting up an innovative project to help survivors of domestic abuse. A major trauma co-ordinator at Royal Stoke University Hospital, part of University Hospitals of North Midlands NHS Trust, Ms Burston developed the Safer Steps programme in partnership with domestic violence charity Arch. Since its launch in autumn 2012, the programme has helped more than 400 survivors of abuse and given training to about 200 staff. ‘The publicity has given us the opportunity to form new relationships and networks,’ says Ms Burston. In November, the team will host local and national leaders at a presentation about the service and its future. ‘This is a real opportunity to get key people in one room,’ she says. Ms Burston’s work has gained further national recognition with an NHS hero award. He used his prize money to visit Kerala in south India, where he helped develop better mental health services. ‘The award encouraged me to travel widely and see more,’ says Mr Smith. As a consultant for the World Health Organization, he spent more than a decade visiting 30 countries to improve mental health care. As nurse consultant for looked-after children and care leavers with Central London Community Healthcare NHS Trust, she impressed the judges with her pioneering work transforming the lives of vulnerable and disadvantaged young people. Since then, Ms Graham-Ray has witnessed many changes in the way health services are delivered, and what she describes as a lot of turbulence in the NHS. ‘But the award has given me the confidence to stand up for nursing,’ she says. ‘When services are being reorganised, I am now more able to say “that won’t work”. And the reaction tends to be “well, she did win nurse of the year, so we’d better listen to her”,’ she says.